Little is known about this group other than that they numbered six and met several times over the summer of 1959 with intentions to dismantle and reimagine popular Irish Ballads using chance procedures. The only surviving artefacts from these meetings are a collection of postcards apparently sent between members of the collective to a P.O. Box as part of an obscure game and several pages detailing dice procedures designed to rearrange popular Irish Ballads. It is not clear whether any of the revised ballads were ever performed, though a list of instruments and sound sources was discovered in a box with an unusual selection of bespoke wooden dice believed to have been produced by the collective. The quantity of non-cubic dice named within the procedures of the Aleatoric Revisionist Balladeers is notable and indicates the presence of carpentry skills and a solid knowledge of polyhedrons amongst the members. 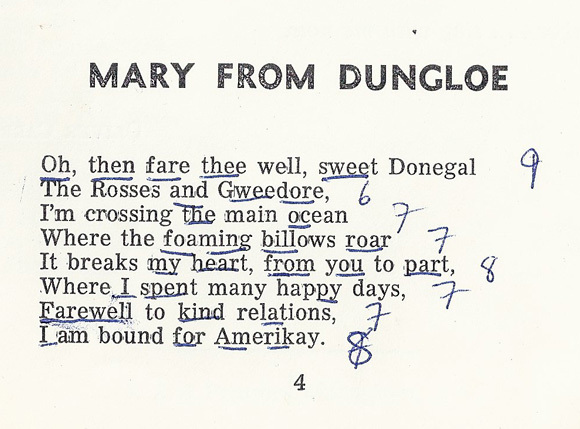 It is difficult to accurately pinpoint the true identities of the balladeers as they operated under non-gender-specific pseudonyms thought to be an anagrams of Nationalist Irish ballads including: Oró Sé do Bheatha ‘Bhaile (a rebel song popularised by nationalist poet Padraic Pearse) and Amhrán na bhFiann (The Soldier’s Song; an Irish Volunteers anthem). The scant documentation that does exist can be traced back to this collective through these pseudonyms as they appear nowhere else in Irish history: ‘Bhaileé Soró Bodheatha, Bráf Hinnan Hamna, Firnnahm Báhnan, Háinnan Brafhamn, Hésordh Thaealó ‘Baiebo, Séatha Boródhaile ‘Bohe. 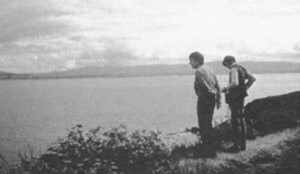 Several photos from the American composer John Cage’s 1979 trip to Ireland have these pseudonyms scrawled on the back in faint pencil, suggesting that the collective had some link with Cage at this time. The surviving notes from the summer of 1959 indicate a strong interest in chance procedures and we can safely assume that in this regard Cage was a key point of reference: The P.O. Box address chosen by the collective (433) for their correspondence is thought to be a reference to Cage’s influential work of the same title. The source text which appears to have been most commonly used by the Aleatoric Revisionist Balladeers is an early draft of the The Guinness Book of Irish Ballads as many of the outcomes in appendix 1. feature phrases and references contingent with the material provided in that collection. The decision to work from this text, with traditionally Irish instruments and with picture postcard imagery suggests that the work of the Aleatoric Revisionist Balladeers was in part an interrogation and reconstruction of constructed Irish identity. Brian. E. McCandless. (1998). The Pastoral Bagpipe (Iris na bPiobairi), In: The Piper’s Review #17, Spring 1998, p. 19–28. Carr, O. (1974). The Guinness Book of Irish Ballads. R&S Printers, Monaghan: Guinness Group Sales (Ireland) Ltd.
Joyce, P.W. (1909). Old Irish Folk Music and Songs. Dublin: Hodges, Figgis & Co. This entry was posted in Graphic Scores, Indeterminacy, Traditional Music, Vocal. Bookmark the permalink. The Reverend Joseph Garvan Digges, M.A.